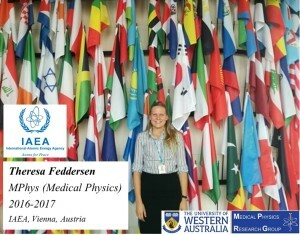 The current page is about Theresa Viktoria Feddersen, a successful UWA Medical Physics graduate. She is currently an intern in the Division of Human Health, Department of Nuclear Sciences and Applications, at the International Atomic Energy Agency (IAEA), Vienna, Austria. “Theresa was one of our enthusiastic postgraduate students. She showed interest in radiation protection and radiation physics during her masters at UWA and we arranged for her to voluntarily attend special practical sessions at Sir Charles Gairdner Hospital in Perth to gain practical knowledge and experience in the field. Theresa attended a few monthly QA sessions for linear accelerators, as well as cyclotron service procedures and learned about the importance of radiation protection and safety. She also received certification on safety testing of lasers. Theresa’s research project on commissioning of a new small animal radiotherapy machine at the Telethon Kids Institute was a unique learning curve for her. The project gave her opportunities to experience in X-ray imaging as well as radiotherapy and treatment planning”. When Theresa first arrived looking to do the Masters of Medical Physics I suspect she was a little unsure of what to expect. It was excellent to see her embrace the field and to thrive on the material she was learning. Her project involved commissioning a small-animal image-guided radiotherapy platform, the first of its kind in Australia. This allowed Theresa to get hands-on experience with typical medical physics work, though in the unique environment of a research laboratory. The work Theresa undertook was essential for characterising the device and for improving its use for the many cancer research projects that will now use it. 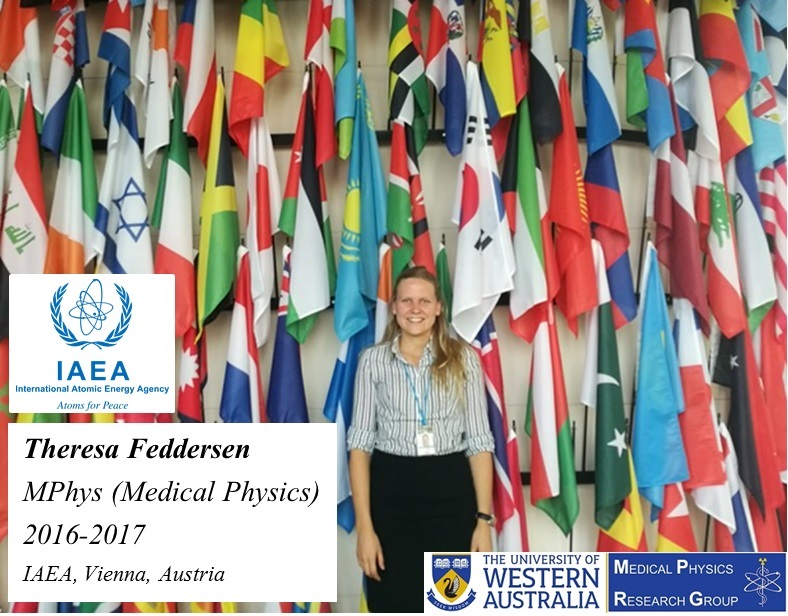 My name is Theresa Feddersen, I completed my Masters of Medical Physics mid-2017. I currently work as an intern at the IAEA in the Human Health Section. I help out with various projects from establishing an online learning platform for IGRT, to verifying a plug-in developed for nuclear medicine quality control. It really is an excellent program and highly relevant. There is not one thing I learned that is not useful knowledge in the field today. This in combination with the practical sessions gives a very solid base that makes me feel comfortable with what I know today. My research project title was: “Commissioning and Dose Delivery in Small Animal Radiotherapy.” Since this is the first device of its kind in Australia, I feel like I have managed to tackle something new and establish a solid base that hopefully will be taken advantage of for animal radiotherapy research in the future. Listen to your lecturers, and take advantage of all the practical sessions offered. They are there for a reason and even if it doesn’t make sense at the beginning, it all comes together eventually. Introduction: Radiotherapy is the use of ionising radiation to deliver energy (‘dose‘) to patient tissues. Testing alterations to treatment is important, but difficult to perform on the human population due to lengthy clinical trials, questionable ethics, many study subjects needed to achieve statistical certainty, and it rarely being possible to undertake detailed anatomical studies post-treatment. Pre-clinical studies can be undertaken on small animals in order to overcome these difficulties, as devices for delivering radiotherapy treatments on small animals are now available (micro-irradiators). These devices attempt to mimic the dose deliveries achievable with clinical units and are considered a major step forward in cancer radiobiology research. Aims: The main aim of this project was to lay a solid and reliable base for future research to come using the newly acquired small-animal radiotherapy device, the X-RAD SmART at the Telethon Kids Institute (Perth) and establish whether the dose delivery is accurate enough for the results to be transferred to clinical trials. This was achieved by firstly commissioning the device, and subsequently comparing the results to values available from literature. Next, its delivered dosimetric properties were compared with the theoretical ones obtained from the treatment planning system (TPS) and their agreement was quantified. The final aim was to deliver three different treatment plans of varying complexity to a phantom and compared the dose map delivered in the phantom to the dose map that the TPS predicted to be delivered via gamma map analysis. Results: The obtained results from the commissioning were generally in good agreement with published values. The smallest field size investigated (2.5 mm diameter) produced the greatest differences. The discrepancy between the relative dosimetry results in the treatment planning system (TPS) and the EBT3 film in the solid water phantom was quite large for several profile descriptors (flatness, symmetry and penumbral width). Only the field size produced acceptable agreements of <6.2%, for all collimators except for the smallest field size (2.5 mm diameter), which only had agreement of 17.3%. The discrepancy between the dose plane of the TPS and the film in the rat phantom was expressed as the % acceptance: it was 100% for a simple plan, 88.3% for a medium plan and 69.2% for a difficult plan (considering a 3% dose tolerance and 0.6 mm distance tolerance). Conclusion: This project laid a good basis for further research to come using the device and determined the accuracy between delivered and planned dose. It demonstrated that not all conventional quality assurance (QA) tests are appropriate, since the beam properties and the dimensions are different than in clinical machines, and the protocol needs to be adjusted for such. It has been concluded that the research done on the X-RAD will be resulting in valuable results and has the potential to be transferrable to clinical trials, limitations and considerations when working with the device were highlighted. We wish her all the best and success in future.